Discussion in 'Transformers General Discussion' started by Lumpy, Feb 21, 2006.
those are 3 of the more extreme examples, but rhinox, cheetor, transmetal rattrap, and countless others ive got at least 3 of....so, how much is too much? I'm of the mind that if you can't display them, then why keep them (unless you hope they appreciate in value to sell later)? I'm trying to sell a number of toys for that reason. i used to be able to display them all, then moved into a smaller apartment, so i rotate my display, the moved into an even smaller place with my girlfriend, and rotate still, but someday, i want a house to set them all in, but its the fox repaints and stuff that get to me, ive almost got a complete beast wars set, only missing like 12 figures, so its the thought between complete versus my sanity and not having 5 of the same toy...right now, ive got all my waspys out, and i know that the original, and the fox kids repaint could easily go, now that ive got the 10th....but...do i dare sell and ruin my completedness? I buy every version of any type (American and Japanese). 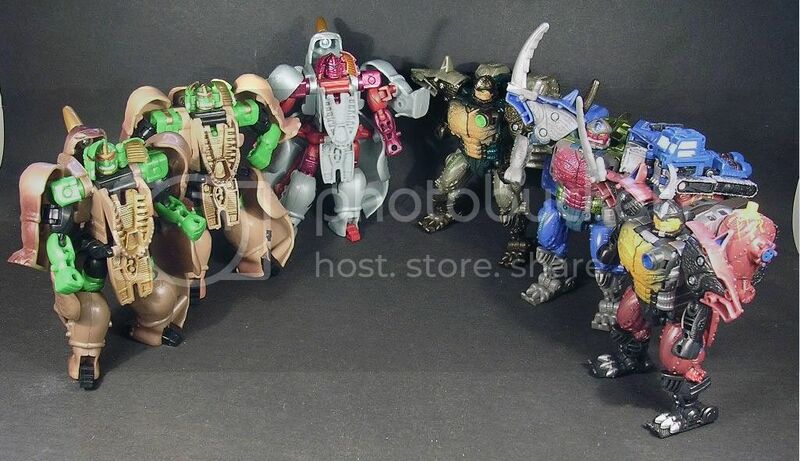 TM Rhinox is a great example - there are several variations in color of the BW Metals release, as well as a bunch of versions domestically (TM, FKTM, Armada). For me, every redeco = entirely different toy. But that's just me! 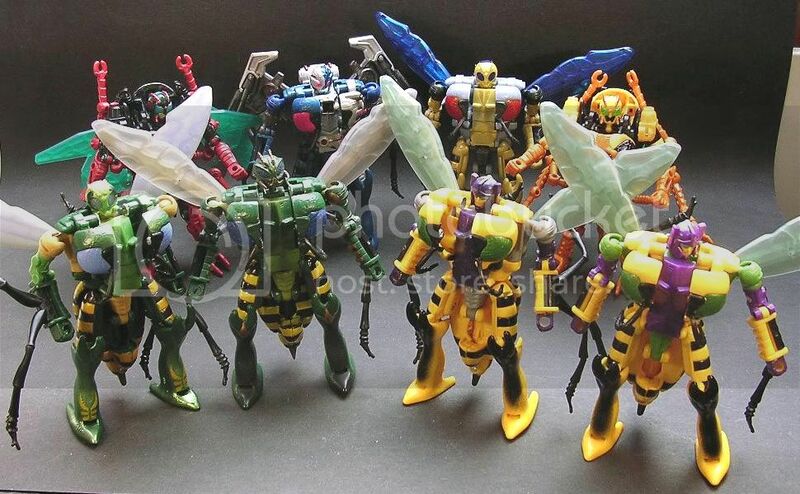 Just box them up and store them - if you're ever at a point where you do have room to display them all, you might be disappointed that you got rid of them (and let's face it, loose Beast Wars stuff isn't exactly burning up the aftermarket, so you'd probably lose money if you sold). Hmmm... I don't know how many are too many, but I'll give ya' an idea of how I collect this stuff. 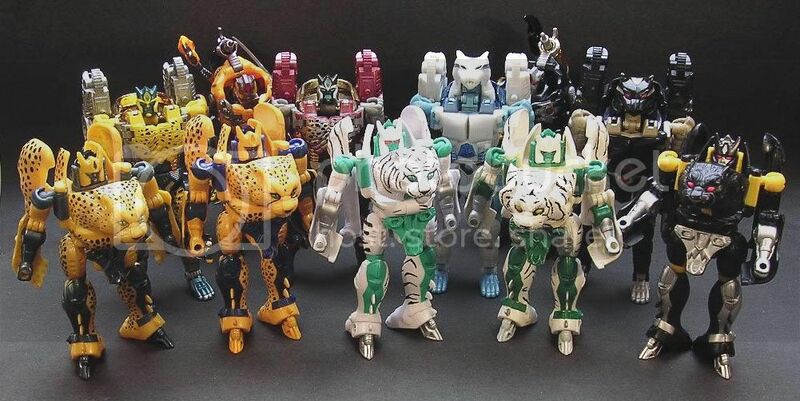 I have the Cheetor with green eyes, and will eventually get Tigatron, but only because of the show... I'm such a sheep. The others, as far as I'm concerned, are just repaints, and I don't want 'em takin' up space in what limited room I have... ESPECIALLY the eye variants. Again, I have the original Transmetal Cheetor, and will probably get the Metals Ravage, because of the whole sheep thing. I don't do exclusives, and Mini-con ports aren't enough of a reason for me to buy another one. I have the original, and... HOLY CRAP... They actually repainted this thing!?! Currently, I have 3 outta' 14, but will eventually have 5 outta' 14. Presenting the other side of the coin again, I've purchased ALL of those - even all the different-eyed Cheetors. I think its a personal thing really...if you're into being a completionist, thats totally cool. sell one on ebay. once you get rid of that first one, it'll be a huge relief off of your shoulders, then you can pave the way for getting rid of a few more. come on man you can do it!!! Eh, it comes down to keep 'em or sell 'em... unless they're the Fox Kids repaints, in which case I would just melt them down. I would love to see some of the ones you say you are missing Pics anyone? I have all the BW and BM show character toys. One of each is plenty. I have the originals, and then the TMs. Any more than that is just a waste of space and money IMO. Though you can do whatever you want with yours, it's all good as far as I'm concerned. To each his own. I looked at my collection a couple of months ago and thought "yeah, that's too much" so I've decided to just stick with 6 autobot alternators and my decepticon alternators and 20th prime. Everything else (G1, Beast Wars, Beast Machines, RID, Armada, Energon, Cybertron) is going towards my nephew to play with when he goes over my parent's house and eventually to a future son if one ever comes about.